Google Earth goes beyond its initial purpose and has a new feature that lets you explore the sky. The latest version (Google Earth 4.2) brings what could've been a separate program for rendering the sky, like Stellarium. After launching the application, click on the black rounded icon from the toolbar and switch to the sky mode. 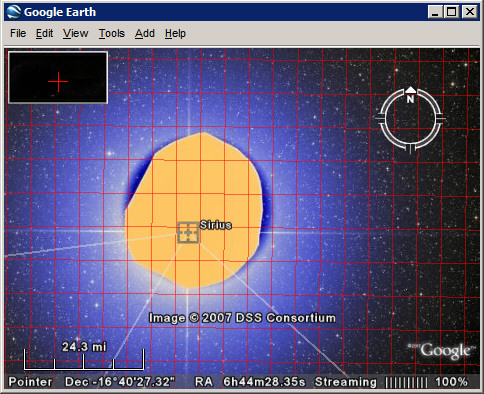 Google Earth shows the sky from the current location and becomes a virtual telescope for amateur stargazers. "This easy-to-use tool enables all Earth users to view and navigate through 100 million individual stars and 200 million galaxies. High resolution imagery and informative overlays create a unique playground for visualizing and learning about space," explains the press release. The layers include a lot of interesting information about stars, constellations, galaxies, images from the Hubble Space Telescope. "Never before has a roadmap of the entire sky been made so readily available. Anyone interested in exploring the wonders of our universe can quickly see where the stunning objects photographed by Hubble actually dwell in the heavens. Sky in Google Earth will foster and initiate new understanding of the universe by bringing it to everyone's home computer," said Dr. Carol Christian from the Space Telescope Science Institute. 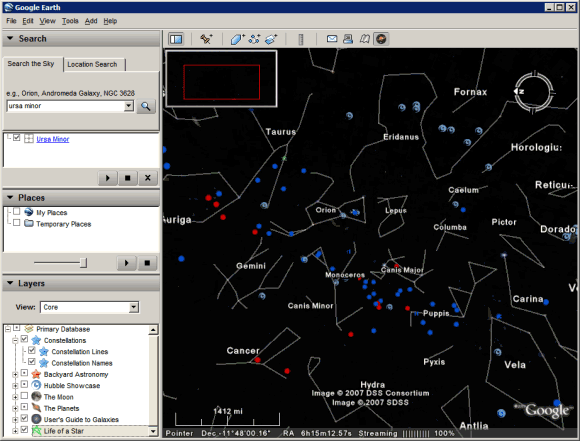 Celestia is also a really great program, like Stellarium. While both of these programs are probably better than Google's Skyview, it's nice to have an all-in-one application like Google Earth. And since this is just the first public release of Skyview, we can expect to see things get better, hopefully. I agree with jyvyn. Celestia is a really great astronomy program. What makes it better than Google's offering in my opinion is how the user moves around to "sky". Celestia provides a real 3d simulation of space, so you can really travel from one place to another. Google earth's way however is quite confusing because moving around doesn't feel like you're in a spaceship (as how Celestia does it). What you do is just pan, zoom in and out to view the different space objects. I find it actually confusing. SO HAS ANYONE GOT ANY IDEA WHY THE SIRIUS STAR SYSTEM SEEMS TO HAVE BEEN BLOCKED/SENSORED? IMAGES ARE FROM SAME TELESCOPE, BUT MICROSOFT TELESCOPE IS ALSO SHOWING THE SAME DISPLAY. GOOD LOGICAL ANSWERS PLEASE, WOULD HELP GREATLY IF UNDERSTOOD REASON FOR IT. why they don't show as the sirius? In this fabulous age of information it seems silly to get hung up on the most intuitive and initial reactions. How do I view the sky from my location?